When it comes to protecting our country from harm, airmen must be fearless under pressure. Honor the airmen in your life for their courage and heroism with our Air Force 2-Coin Velvet Box. Your gift comes complete with an Air Force Service Coin, a liberated Iraqi coin, our Products for Good story and certificate of authenticity. Give the airmen in your life a gift they will forever cherish. 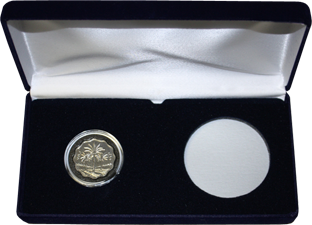 Our customizable Air Force 3-Coin Velvet Box features a liberated Iraqi coin, an Air Force Service Coin and a commemorative coin of your choosing.